Very subtle humor. Probably incompatible with the average American anime fan. Usually not as funny as "Home Movies"(1999) but if you're a fan of that you'll probably at least find "Peeping Life" amusing. Considering Japanese animation's hardened tendency to express "unnatural" characters and scenarios and the tendency of the average internet-active anime fan to be psychologically underdeveloped/repressed/socially inexperienced (this is an observation- not an insult) it makes perfect sense that this show would go over people. It's really unfortunate as this is great content. Highly recommended. Humor as dry as Death Valley, California, seriously. I can understand the amount of criticism Peeping receives because it is a very acquired taste. That said, I enjoyed it. It's not a show that you binge watch in addiction, but in small doses I appreciate it's unique comedic approach. These are the boring, ordinary lives of superheroes in contradistinction to their usually fantastical adventures. A series of two man Japanese-style comedy sketches done with mo-cap animation. 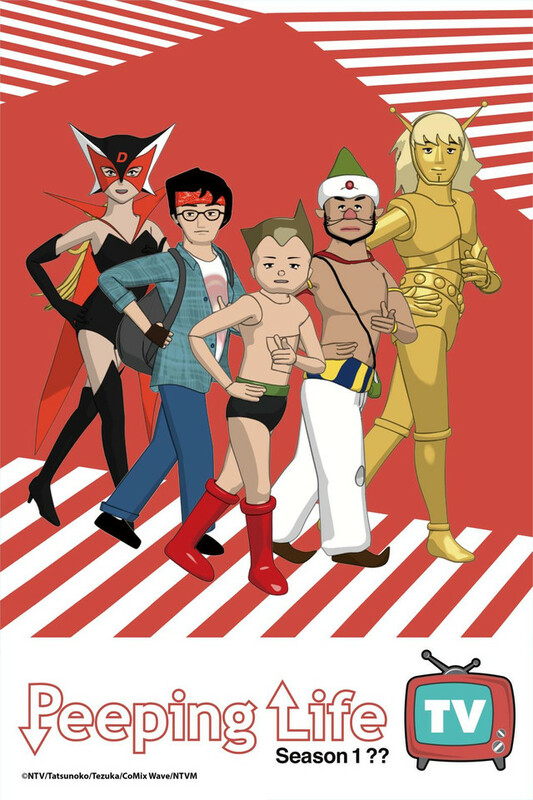 Many of the sketches feature some old-school characters like Astro Boy or Casshern, but many are just caricatures from normal Japanese life. I get the hate, it's a weird tone, a weird style of comedy. But I laughed, I was dragged along, I had some fun and would love another season of it. The dialogue is great, the characters are funny. It's original. Really happy crunchyroll takes a risk on something different. Aren't there enough "15 year old boy discovers magical powers and fights monsters" shows? Or how about I wake up and I'm trapped in a video game. *sigh*. The only thing not good about this show is the last scene of the last episode. ...but a selection of few will definetly love this! Reminded me of Arakawa Under the Bridge's insane humor, especially the one you see in the live action. Everything is too spaced out and drawn too far, and that is exactly what makes this show hilarious! For starters, this show fails at quite literally everything. The humor is non-existent, with skits going on for far too long, with little to no comical substance, this lack of substance is further amplified by the terrible delivery of the sub-par voice actors and actresses, this alone makes for a terrible time, but it's only just beginning. The overall animation is dreadfully inconsistent and choppy, the style is very poor as well, with bland, cardboard cut-out characters (some directly imported from other shows/manga), the backgrounds are simply random and extremely plain, with zero imagination or thought put into any them (or this show in general for that matter). I watched it and I did not enjoy it. Maybe for others, this type of show is hilarious but for me this was not the case. The animation is bad and the comedy was to dry. Now again, this may sound appealing to some, but It was not my cup of tea. Watch it if you want, but for me it is not a good animation. Although the premise of the show is great, the jokes are lame and the quality of the anime is poor (not just cheap). I think it may have worked If they had chosen a shorter format, because the sketches are far too long resulting in shallow unfunny dialogues. And the point is to put these characters in everyday situations as if they were regular folks with everyday problems. Writing and voice acting are right on. Dry Absurdist Humor. Not for the weak of mind. Really funny if your into that kinda thing. I was cracking up. Oh man "Air is the most important thing! ", brilliant. It's telling me I need a longer review but how much can I really say about it? Oldschool character being realistically dumb in daily life events.